Born out of The Tithe, 'Samaritan: Veritas,' takes on a whole new target as hacker Samantha Copeland is on the run and looking for revenge. It's a thrilling new chapter from Top Cow's Edenverse written by Matt Hawkins with art from Atilio Rojo. The Tithe found Samaritan taking on nefarious mega-churches and this time the only things more corrupt are the U.S. government and military contractors. The President is in Samantha's crosshairs but she's also a hunted woman using all her hacking skills and the resources of the dark web to counter her pursuers. It's this complex cat-and-mouse game that Hawkins unfolds while also providing Samantha's background for new readers. Hawkins does a delicate balancing act adding exposition with flashbacks while moving the story forward in the present and introducing new characters. 'Samaritan' is an immersive story that hums like a fast-paced political thriller. You can't help but see the influence of television's "24" and "Mr. Robot" with the intrigue of movies like The Bourne Identity and Patriot Games. Hawkins has done his homework giving this high-stakes drama a grounded and realistic portrayal of an abuse of government power and the illegal methods in which to counter such actions. Rojo choreographs a dynamic and exciting issue. The varied points of view and detailed backgrounds really convey urgency and depth in every scene. Rojo's command of action and firearms help punctuate scenes where a kill shot needs an appropriate oomph! But really there's nothing Rojo can't do and with his slick color schemes, every page is rich with color and moody as needed. Hawkins and Rojo are in sync providing a nice one-two punch where story and art find synergy. 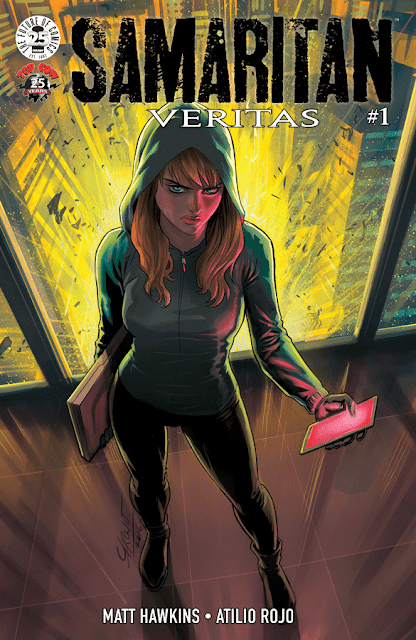 'Samaritan: Veritas' is off to a magnificent start full of intrigue, action, and dubious characters. It's a stellar addition to the Edenverse that incorporates many of Top Cow's best titles and ties them together. If you enjoy tense political thrillers with great visuals then this is for you. Hawkins and Rojo drop you right into the action and the pursuit is on. Make sure you don't miss it.